Rep. Greg Gianforte stepped up his efforts to “restore balance” to environmental ligation on Thursday, saying reforms are needed to keep extremists and special interest groups from filing lawsuits to block projects they oppose. Gianforte, the Republican chairman of the Subcommittee on the Interior, Energy and Environment, made those claims during a hearing where he blamed “serial” environmental plaintiffs for working to stop everything from sensible forest management to irrigation projects. Those plaintiffs, he added, are using the court system to restrict access to federal land, obstruct infrastructure development, and stifle the use of natural resources. Gianforte said he offered an amendment to the Fiscal Year 2019 budget for Interior appropriations to block the “sue and settle” practice under the Clean Air Act, the Clean Water Act and the Endangered Species Act. While that hasn’t been taken up by the Senate yet, he’s now seeking additional opportunities to reform and eliminate provisions in environmental law he says are misused. That includes stages of the legal process often manipulated by special interests, he said. 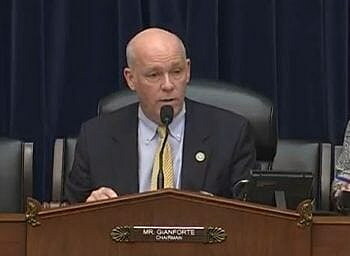 Stacy Plaskett, D-New York and ranking member of the committee, disagreed with Gianforte’s take on the alleged environmental abuses under the Equal Access to Justice Act. It was adopted, she said, to ensure small businesses, individuals and nonprofits can hold government accountable for unlawful actions – and inaction – even if they don’t have vast sums of money to take on the government. Plaskett said it was false to suggest that environmental groups sue too frequently, receive too much in recovered fees and ultimately change the priorities of the federal government through litigation, despite Gianforte’s claims. According to a 2011 report by the GAO, she said, most of the cases filed against the U.S. Environmental Protection Agency were brought by trade associations and private companies, not environmental groups. The Administrative Conference of U.S. found similar results by reviewing the amount federal agencies are paying under Equal Access to Justice and the cases brought under it.